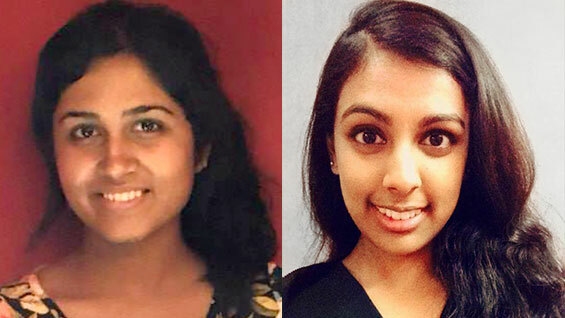 Anushree Sreedhar ChE'18 and Neema Aggarwal EE'15 were mentored by alumni about career options. Starting in Fall 2014, Jolie Woodson, the Director of Engineering Career Development and Outreach Center for Career Development, working in collaboration with the Office of Alumni Affairs and Development, started a mentoring program for students in the Albert Nerken School of Engineering, a plan she’d fostered for a long time. “It was something I always wanted to bring to Cooper, as I saw the tremendous value for students to have that support and guidance from experienced professionals, and for alumni to feel connected to the institution in a deeply meaningful way through their one-on-one engagement with students,” she says. After reaching out to alumni and students that first year, Ms. Woodson arranged for 25 mentor-mentee pairs; by the second year that number went up to 32 pairs. While some mentoring occurs in person, a lot of alumni are outside of New York, so they and their students make contact through Skype or by phone during the academic year. Unlike mentoring programs outside of the school, the mentor and mentee share common ground as former and present Cooper students and that often helps break the ice. “Students are often more engaged when they can connect with a professional who previously walked in their shoes and the students and alumni connect over their shared experiences at Cooper - which is a great place for a relationship to start,” Ms. Woodson says. Ms. Woodson says that mentors are most effective when they prompt students to re-evaluate assumptions they might have about themselves or the professional world. Ron Carsten, a 1969 graduate in Electrical Engineering who was Raytheon’s Chief Engineer for Missile Systems, has mentored students both years of the program. He feels his greatest success has been getting each of them, Neema EE’15 and Arvind Nagalingam EE’17, to articulate their professional goals and to give up assumptions they each harbored about the opportunities available to them. “The students lacked a fundamental understanding of what engineers actually do for a living. They have an academic understanding of how to solve technical problems, but they lack a practical understanding of how one would go about applying that knowledge in the real world,” he says. “The discussion needs to be in a safe environment where the students feel that the mentor is not directing their actions, but helping to guide them through the discovery process. It takes an investment in time and interest to establish such a relationship." In their initial meetings, Mr. Carsten, who after 42 years with Raytheon is now a private engineering consultant, listened to the students to get a clear sense of their professional interests, what they imagined themselves doing once they entered a field, and where they were willing to live. This last, he feels, is of particular relevance to anyone wanting to practice electrical engineering since, he says, New York is not a hub for what he calls “real engineering.” He goes on to say that students’ training should help them understand and be excited about the realities of the field. Arvind, for instance, debated whether or not he should earn his masters degree at Cooper now, or work for several years before returning to school. While Mr. Carsten advocated for continuing his formal education now since he had only a few classes to complete a second degree, Arvind pointed out that if he went to work, he could have first-hand experience and perhaps have his master’s paid for by his employer. “That was something Ron hadn’t thought of. We talked a lot, and I think we both learned from the conversation.” As a result of the mentoring sessions, he realizes that if he wants to work in hardware development, he must be open to moving to different parts of the country. Besides offering specific career advice, Ms. Woodson points out that a mentor can help a student begin building her professional network. For instance, when advising Neema, Mr. Carsten recognized that she would benefit from talking to a female engineer who could address the particular obstacles faced by women in a traditionally male field. “I arranged a phone conversation for her with our Engineering VP, a woman who is very active in SWE [Society of Women Engineers], and for whom I have great professional respect. It was a very positive discussion for both of them,” he says. Neema, who was debating between a career in engineering or one in finance, concurs that the experience was invaluable. Mr. Carsten encouraged her to apply to jobs in engineering to have a fuller understanding of what opportunities the field might offer. As a result, she applied to several engineering jobs and was made a number of offers. “I think I would have very much regretted it later if I never even tried to pursue a career in engineering. Now I know I tried, and then I made a well-informed decision to go into managerial consulting instead.” She believes that pairings of mentors and students should be primarily based on students’ career interests. Arvind too was torn between two fields—engineering and business—but his talks with Mr. Carsten convinced him that he really could find work in engineering. “Ron was really able to help Arvind get perspective on the world of engineering, and in large part because of working with Ron, really has a renewed interested in engineering,” Ms. Woodson says. “What has always impressed me about members of the Cooper community,” says David Minder, Director of Engagement, “is their passion for the school and their willingness to get involved. The Mentoring Program has been a wonderful opportunity for alumni to give back, to use their experience at Cooper and in their careers to offer invaluable guidance as the student navigates through the Cooper experience and beyond. After the success of the program, we hope to expand these volunteer opportunities for our alumni." Ms. Woodson is continuing to draft mentors for the program. Follow this link to learn more.